According to Forbes, women control 70 to 80% of consumer purchases. That is a huge number, and it is one that businesses and the marketers behind them need to be paying attention to. Women are consuming content and paying attention to advertising, but the companies who are setting themselves apart are the brands who are paying closer attention to their messaging rather than simply trying to get it in front of people. Women are very active on social media, and they are willing to interact, engage and spread the word about services and products that they have fallen in love with. Companies have the opportunity to turn their female audience into unofficial brand ambassadors who take word of mouth to a whole new level through the megaphone of social media. So how can you make women fall in love with your product, your service, or your brand? Since women are so active on social media, there is a very good chance that your female audience is already telling you a lot about themselves. They are venting publicly, they are taking pictures of their favorite products, they are polling their friends for advice and they are sharing their own recommendations. They are talking, but are you really listening? Once you start paying attention to your audience, you will start to see trends. You will start to get inside their heads and begin to understand their daily struggles and successes. Once you understand those struggles and successes, acknowledge them. Validate those day-to-day difficulties. Give a pat on the back for those smaller triumphs. Everyone loves to feel like they are understood, and everyone appreciates more recognition for the work that they put into simply living their best life. They deserve the respect of having a message delivered to them that helps them in some way. Marketing has a history of being patronizing and overly-simplified. Respect that your audience is an intelligent body of people who will appreciate the subtleties of storytelling and transparent messaging. It becomes much easier to inspire your audience once you begin meeting them where they are at. You are able to understand where they are coming from and where they want to go. This may sound overly sensationalized, but it can hold true for a product as trivial as a t-shirt. That t-shirt might put a smile on their face every time they wear it, and that means something! They want to buy products that make them feel something from a company that they believe in. Of course, to make all of this work you have to be a very strong company with a very solid foundation and core principles. Which Brands Are Doing a Good Job of This? Gatorade – They have produced memorable ads with Serena Williams highlighting her strength and perseverance. Adidas – They are creating different product lines for different age groups of women like Adigirl for 13- to 17-year-old female athletes. Under Armour – They have partnered with Misty Copeland (the incredible ballerina) for an ad that has over 10 million YouTube views. Marketing that displays women in a positive light is a smart move all around. Of course, it is just the right thing to do – women deserve to be treated like the intelligent, strong, and powerful humans that they are. Then the bonus is that this type of marketing works in a business sense as well. 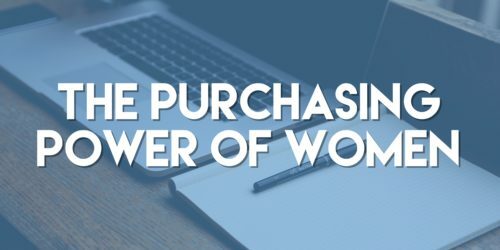 Women have the purchasing power – up to 80% of purchasing decisions, remember? – so it only makes sense to listen closely to what they want, and then deliver that to them.